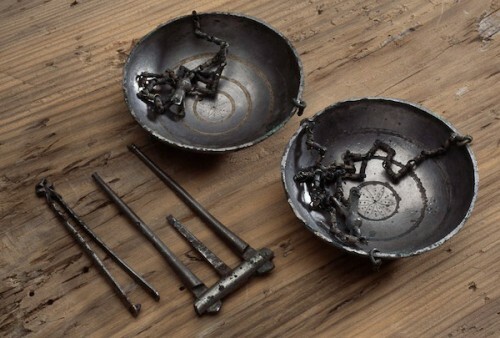 A silver button and a set of balance scales found at Lø, near Trondheim, Norway (ca 1000 AD). When archaeologists Geir Grønnesby and Ellen Grav Ellingsen found these and other artefacts during a dig in mid-Norway, they realized they had intriguing evidence of a Viking-age trading area mentioned in the Norse Sagas. The finds came from two separate boat graves in an area in Nord-Trøndelag County called Lø, a farm in part of Steinkjer. The archaeologists, who both work at the Norwegian University of Science and Technology’s University Museum, were there to conduct a routine investigation required because of an upgrade to Norway’s main national highway, the E6. But instead of a simple highway dig, the researchers found themselves with a potential answer to an unsolved puzzle about a mysterious Viking trading place that is named in ancient sagas, but that has never before been located. “These finds got us thinking about the descriptions in the Sagas that describe Steinkjer as a trading place,” the researchers wrote of their findings in Vitark, an academic journal published by the University Museum from Dec. 2012. “The Sagas say that Steinkjer, under the rule of Eirik Jarl, was briefly even more important than Nidaros, before Olav Haraldsson re-established Nidaros as the king’s residence and trading city”. Nidaros, now the modern city of Trondheim, was Norway’s capital during Viking times, and the country’s religious centre. The world’s northernmost Gothic Cathedral, Nidarosdomen, was built in Trondheim, with its first stones laid in 1070 over the grave of Olav Haraldsson. The oldest existing parts of the cathedral date from 1183. As a medieval city and a religious capital, Nidaros played an important role in international trade throughout the Middle Ages. The Lewis Chessmen, an exquisite set of 12th century chess pieces worked out of walrus ivory and whales’ teeth, are widely believed to have been crafted in the Trondheim/Nidaros area, and traded away. Olav Haraldsson was the Norwegian king who is often credited with bringing Christianity to Norway and whose sainthood, first proclaimed in 1031, a year after his death, was confirmed by Pope Alexander III in 1164. Not surprisingly, he features in a number of different Norse and Icelandic sagas. It was these sagas that mention a major trading place in Steinkjer that was even larger than Nidaros. But until archaeologists started the dig in Lø, they had few clues as to where this Viking-age commercial powerhouse might be found. Archaeologists seeking to find a 1000-year-old trading place have precious few leads to pursue. Almost certainly there were no permanent buildings, which would be the easiest to find, and many items that would have been traded would be made of organic materials that might not survive the ravages of the centuries. Apart from finding obvious clues, such as coins or metal or glass items that were clearly from foreign lands, archeologists have to rely on much more subtle evidence that can stand the test of time. One such hint that a location might be a trading place is the geography of the place itself, the researchers wrote in Vitark. “Even though there is no archaeological proof that there was a trading place in Steinkjer during Viking times, there are several aspects that support this idea,” the researchers wrote. Most importantly, they note, Steinjker is located in a natural trading areas, at the mouth of a river at the innermost part of Trondheim fjord. It is also in a place where farmers have been working flat fields for centuries. Another clue that archaeologists use to locate the possible trading place is a detailed map of the locations of all kinds of different archaeological finds that might suggest trade. The logic here is that greater numbers of traded goods are more likely to be found in close proximity to a place of trade, with fewer traded goods found farther and farther from trading areas. So the researchers plotted all relevant finds from Nord-Trøndelag County, and again and again, the finds suggested a major trading area in Steinkjer. Beads made of amber and glass are commonly traded, and the area around Steinkjer was rich with finds of these goods, with 254 beads found in 28 different locales, the researchers said. While nearby Stjørdal had a higher number of bead finds – 485 beads, all told – the researchers noted that most of those beads came from two large finds, which makes it less likely that the beads were linked directly to a trading place. Twenty-two examples of a special kind of Viking-age sword, called the H sword based on the design of its hilt and one that is associated with trade, were also found in Steinkjer, the most of any area in Nord-Trøndelag. Five of six pieces of imported jewelry found in Nord-Trøndelag were found in Steinkjer, while six of 10 imported brooches from Nord-Trøndelag also came from Steinkjer. While beads, swords and imported jewelry help suggest that Steinkjer was home to a major trading place, two specific finds, in boat graves in Lø, were among the most persuasive finds. One, a silver button made of braided silver threads that appears to have originated in the British Isles, suggests that the person in the grave had a high status. The second is a set of balance scales found in another boat grave. The balance scales were constructed in a way that led the archaeologists to believe it came from the west – not from Norway. Scales themselves naturally suggest trade, and when the researchers looked at all the scales found in Nord-Trøndelag, they again found a clear concentration in the Steinkjer area. If all of these concentrations of finds support the location of a major trading place in Steinkjer as mentioned in the Norse sagas, then where is it? Based on the fact that sea levels were four or five metres higher in this area 1000 years ago, the location of the existing church in Steinkjer is the most logical place for the trading place to have been, the researchers say. But confirmation of the fact that Steinkjer was a major trading area in the Viking age raises yet another puzzle: If Steinkjer was such an important area for international trade, why did trade eventually shift to Trondheim, as it did? Grønnesby says that the shift in trading areas was surely due to the tremendous power struggles between different rulers in the area. Nidaros along with Levanger, another trading area, simply had more support than Steinkjer. “We see that Steinkjer disappears in the sources in the Middle Ages while the same sources show that (nearby) Levanger was a trading post,” he notes. Nevertheless, determining the exact answer will require finding more than silver buttons, scales and beads – and may be an answer that we will never really know.